The present book is a collection of scholarly reflections on the theme of humanism from an integrational linguistic perspective. It studies humanist thought in relation to the philosophy of language and communication underpinning it and considers the question whether being a ‘humanist’ binds one to a particular view of language. The contributions to this volume explore whether integrational linguistics, being informed by a non-mainstream semiology and adopting a lay linguistic perspective, can provide better answers to contentious ontological and epistemological questions concerning the humanist project – questions having to do with the self, reason, authenticity, creativity, free agency, knowledge and human communication. 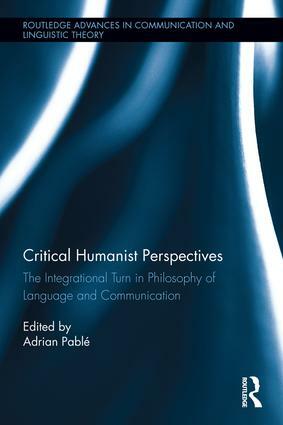 The humanist perspectives adopted by the contributors to this volume are critical insofar as they start from semiological assumptions that challenge received notions within mainstream linguistics, such as the belief that languages are fixed-codes of some kind, that communication serves the purpose of thought transfer, and that languages are prerequisites for communication. Adrian Pablé is Associate Professor of English at the University of Hong Kong.